Tips: Ground chicken or lean ground beef may be used instead of ground turkey, if desired. Suggestion: If desired, serve with a side of warmed apricot or orange preserves or marmalade. Delicious with a side of vegetables or a salad. This ground turkey meatloaf recipe is a great way to turn traditional meatloaf into perhaps a more healthy version, as well as deliver a welcomed change in flavor! Stuffed Turkey Meatloaf begins with some ground turkey (regular or all turkey breast meat - or ground chicken or lean ground beef can be used). As with most meatloaf recipes, the ground turkey is combined with eggs and bread crumbs (in this case, soft bread crumbs from slices of bread, crusts removed). To make things easy, a packet of Italian salad dressing mix is added to the turkey for flavoring (no need to measure different spices and herbs separately). in a rectangular form, then topped down the center with the stuffing mixture. Because you'll be using a packaged stuffing mix, the stuffing is also a cinch to put together (spices and herbs are already mixed in). The stuffing mix is combined with some curry powder (okay, maybe you'll have to measure one little spice), diced celery and mayonnaise (any type of mayonnaise can be used, such as regular, light, low-fat, etc.). Simply arrange the stuffing mix down the center of the turkey loaf mixture (lengthwise), then roll the meat up and around the stuffing. Seal the top and sides, roll it over so the seam side is down, then chill in the fridge for an hour, then pop it in the oven! While the turkey meatloaf is baking, spoon or brush your choice of warmed apricot or orange perserves or jam or marmalade (or cranberry preserves if you prefer and your grocery store carries them) onto the top and sides of the meatloaf a couple times. 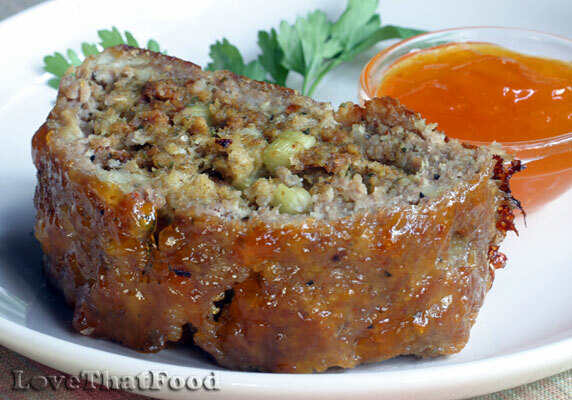 The preserves (or jam or marmalade) will thicken and create a nice glossy and flavorful coating around the meatloaf. You can also heat up some additional preserves, jam or marmalade and serve it on the side in small individual bowls for additional flavor, if desired. Place a 12-inch sheet of waxed paper on a baking sheet. Set aside. In a medium or large mixing bowl, combine ground turkey, soft bread crumbs, eggs and Italian salad dressing mix until blended. Transfer meat mixture on waxed paper on baking sheet and press and shape into an 8x10-inch layer. In a separate mixing bowl, combine water, stuffing mix, sautèed celery, mayonnaise and curry powder and mix until blended. Arrange stuffing mixture on top of meat in a strip down the middle (lengthwise). Using a spatula, lift sides up and over stuffing, then seal top and side edges. Using the waxed paper, gently roll loaf over so the top seam is facing down. Discard waxed paper. Chill in refrigerator for 1 hour, then bake for 40 minutes at 350° F, basting a couple times with preserves, jam or marmalade. Serve additional warmed marmalade on the side if desired.